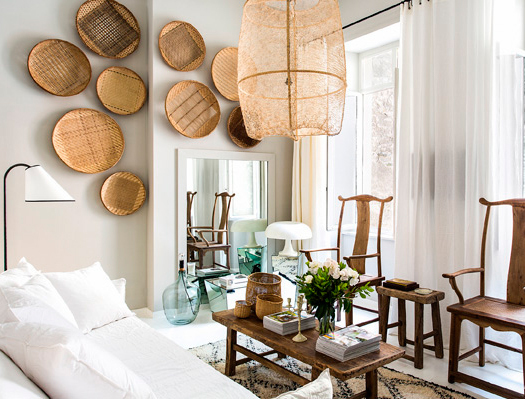 Designers Pierre Emmanuel Martin and Stefan Garoten, the representatives of the company Maison Hand stumbled across the house, listed as a UNESCO World Heritage Site while walking around their native Lyon. The building turned out to be for sale, and the colleagues decided to buy a studio there in order to lease it to tourists. In fact, it is a hotel, but according to the feature set it has a complete interior design. 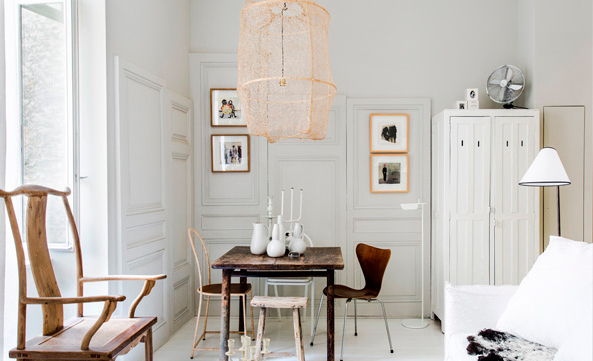 White color – is a constant of the entire apartment. Designers were clearly not afraid to overdo with it. Only the color of natural wood was added to the white color. Pierre Emmanuel and Stephen say that they like the modern design, but in this case they decided to avoid mainstream things. Instead the apartment has many ethnic objects: chairs from China, braided plates from Burma, carpets from Indonesia. 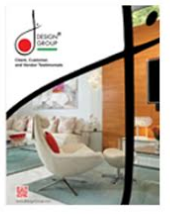 Among the few exceptions – sofa designed by Paola Navone for Gervasoni. The small apartment is accurately zoned with the help of handy things: the territory of seating area was designated by the carpet, the dining area was isolated due to an unusual decoration – authors of the project made the resemblance of wall panels from the old paneled doors. From the hallway it is separated by a wardrobe, the only one in the apartment. It was found at a flea market, and painted white. 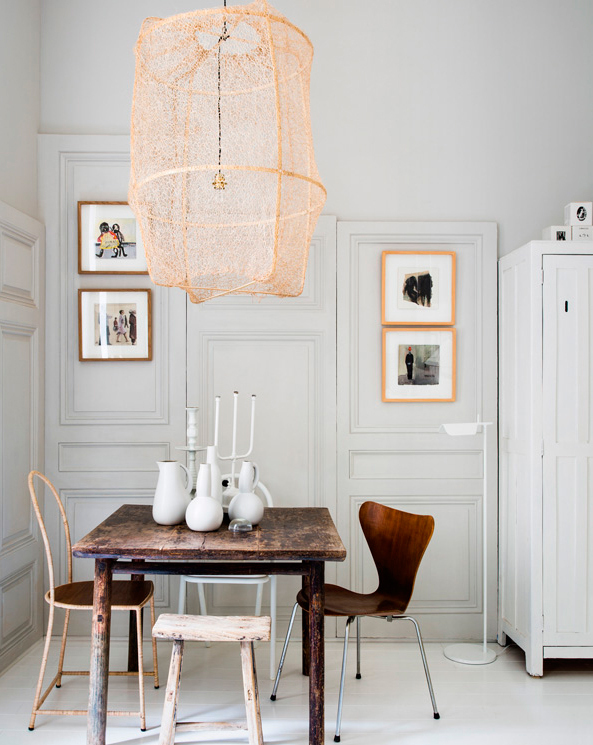 A braided lamp hanging over the table is a dominant item of the interior and emphasizes the height of the ceilings. 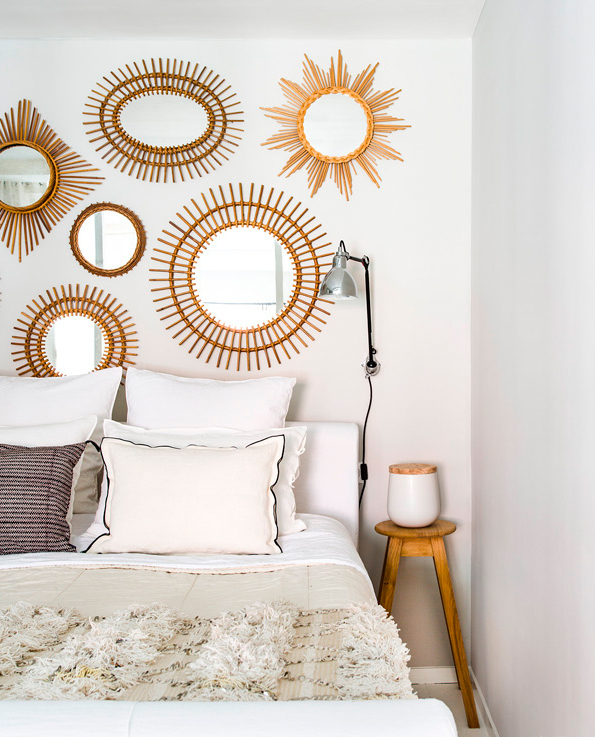 It is designed by Mark Eden Schooley for Ay Illuminate brand and was manufactured in Swaziland in accordance with traditional technologies – from bamboo and sisal. Tea was used as a dye. If the owners decide not to lease out the apartment, they will be able to live there themselves. 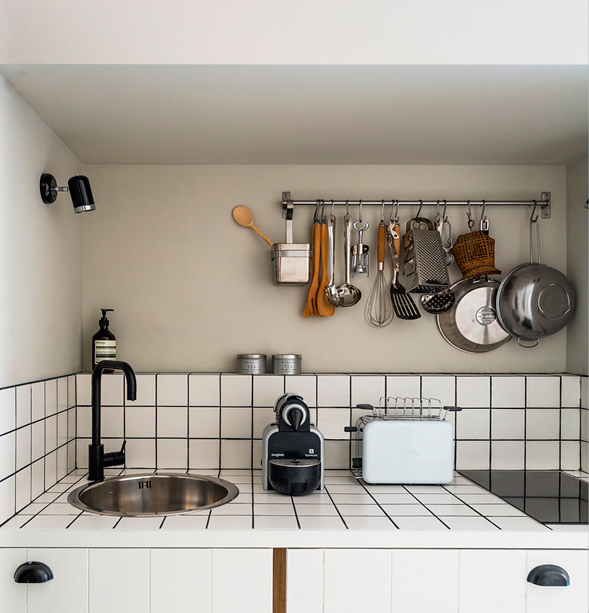 Facades of the lockers from IKEA designers repainted white and tiled the work-top – as a result we see a kitchen set designed as an individual project. For the sake of saving space it was placed in a niche under the bedroom, but in spite of its compact size, it has everything you need: a hob, small household appliances and kitchen utensils. Pierre Emmanuel and Stephen say they collect pretty much anything, and then use the accumulated items for their projects – a selection of similar objects give the interior a lived-in look without cluttering it. 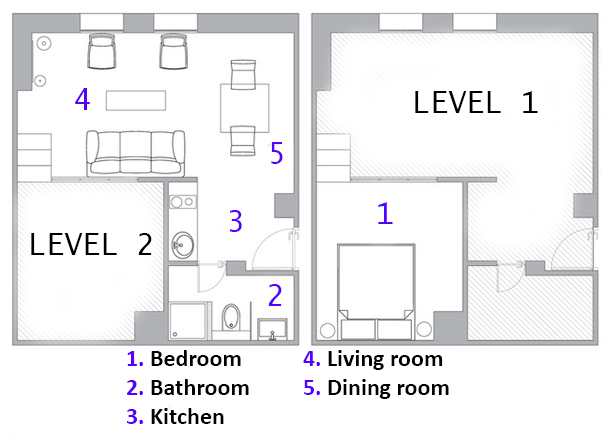 Ceiling height allowed to lift bedroom on the mezzanine – and place the water heating boiler and other life-support systems under it. This trick allowed not only to save the footage, but also make the interior more interesting from the architectural point of view. 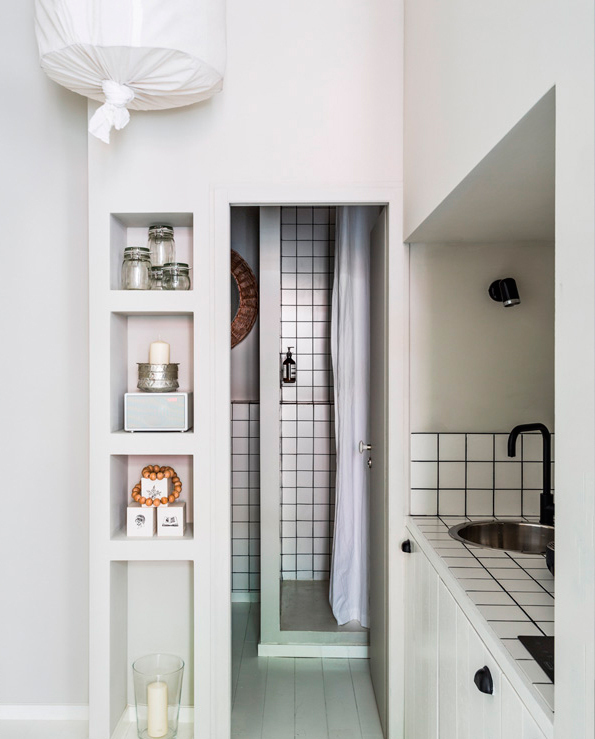 The bathroom is designed as an extension of the kitchen. Floorboards ‘flow’ from room to room, and the walls of the shower and vanity unit faced with the same tiles as the kitchen work-top and apron. Black tile seams and other contrasting details help to structure the space.